OK, if you remember this one, give yourself a pat on the back: Anyone recall Marshall Brodien TV Magic Cards or TV Miracle Cards? Marshall Brodien played a wizard clown on various Bozo the Clown shows. 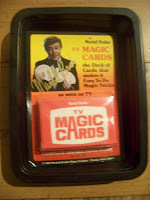 But he may be better known for hawking these trick card decks, selling 17 million of them during the 1960s and 1970s. He apparently is still with us, but his Web site offers up an email address, nothing more. There's also a book about his life. And you can still buy magic sets with his name attached. Marshall's son is in the magic biz too, and his Web site is pretty fun. You can buy an autographed set of the cards on eBay, too. Did anyone have these, or any other magic tricks?